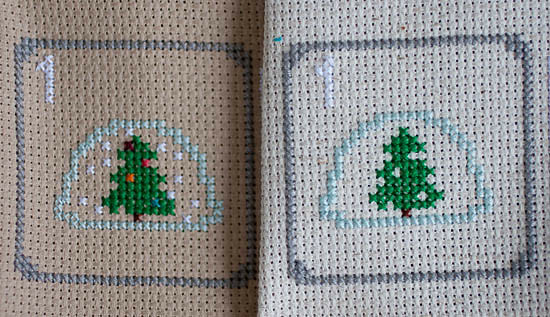 It's so freaking cute, I'm teaching myself how to cross stitch! 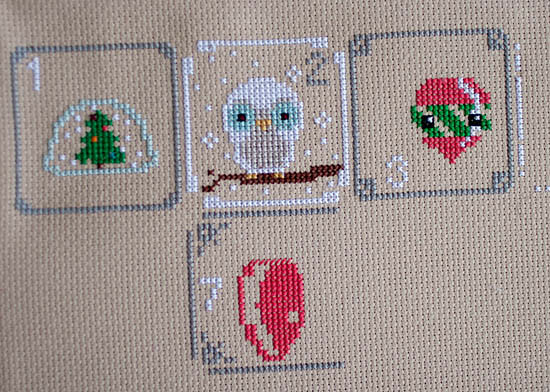 The pattern is by the Frosted Pumpkin Stitchery and it comes with a cross stitch guide, diagrams, color charts and 25 super cute patterns to make up a wintery, holiday countdown. My four weeks of progress. It's slow, but fun! The weather is finally cooling off in California and the nights are dark. 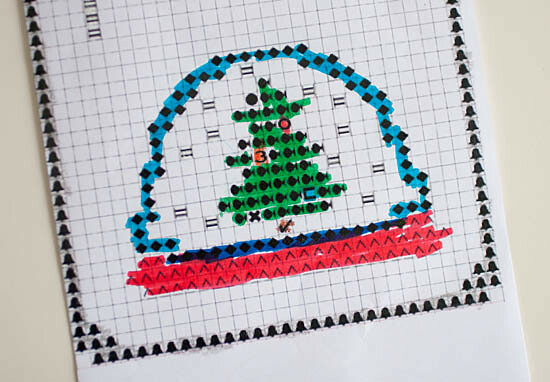 It's a perfect time of year to cozy up for a few minutes at the end of the day and stitch. I started out with a natural colored Aida (above right) called Light Oatmeal. By the time I got the second square I could see it was too light. There was not enough contrast with the white numbers and borders. So I started again with a color called Beige (above left). It didn't look that pretty in the package, but I really like how it looks with the thread colors. My kids are obsessed with this project. They keep asking about it and checking in on my progress, "still working on the square, Mom?". Yes. They can't wait to hang it up. It might be awhile kids. My daughter likes to sit next to me and run her fingers over the bumpy stitches. I wanted to find a way to get the kids involved. One afternoon my daughter and I wound the floss while we snacked and chatted at the kitchen table. Her favorite part was labeling the floss bobbins with the color numbers. Excellent number practice for preschool. 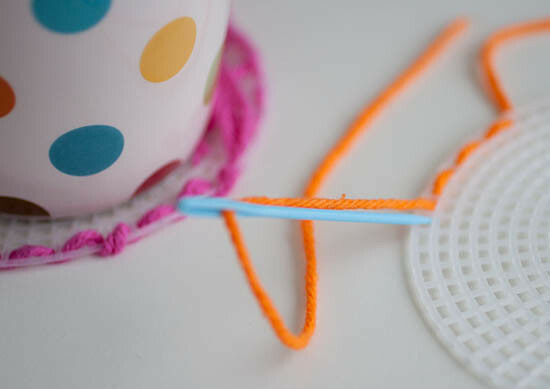 I also picked up yarn needles and coaster blanks for the kids to play around with. They were a big hit! Then the dog chewed it. Daisy!!! Many tears were shed. I keep it under my coffee cup anyway. Both kids love to color, so I printed out over-sized copies of their favorite squares from the pattern and a copy of the color key. I set out some markers for them and I explained how each color has a symbol. They were excited to be coloring detectives and decode the picture. It's actually a lot like the color-by-number worksheets they do. Come and join us!! It's more fun stitching with friends. 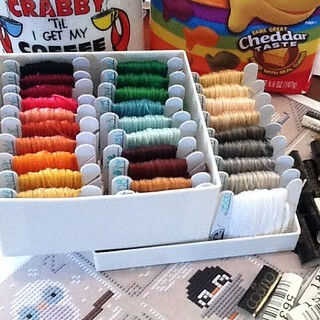 There is lots of stitching action on instagram (#kawaiiwinterwonderland) and flickr. The little sampler is sooo cute! I love that your kids want to get involved with it. Love watching you stitch but I CAN'T start something new. I LOVE your ideas for the secret code too! I'm SO doing that for my grandkids. Along with organizing my floss. I just bought a bunch of the little plastic things. I'm taking the train down to Riverside tomorrow so this will be the perfect project!